If you enjoy reading and are looking for an outlet to meet new people, engage in intelligent discourse, and do it all in the heart of Downtown, then the First Wednesday Book Discussion Group at the Mercantile Library may be for you. Held on the first Wednesday of every month, the group meets from Noon-1pm at the Mercantile Library (GoogleMap). The monthly discussions cover a book of the leader’s choice of whom varies by month. The discussions are free for Mercantile Library members, and cost only $5 for nonmembers. Boxed lunches are also available through advanced reservations for $8. So far in 2009 the group has covered The Emperor of Ocean Park by Stephen L. Carter (January) and The Botany of Desire by Michael Pollan (February). The March 4th discussion is going to cover Out of Stealing Horses by Per Petterson. There is also a Graphic Novel Group that meets on the second Saturday of every month at 1pm. This group is free for anyone who wants to participate and is one of the few of its kind in the nation. The book for the March 14th discussion is Watchman by Alan Moore. If you’re interested in participating in either of these discussion groups contact the Mercantile Library at (513) 621-0717 or by email at mercantileinfo[at]mercantilelibrary[dot]com. 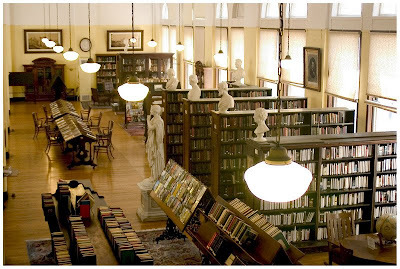 The Mercantile Library is a non-profit membership library. First organized in 1835, the library is Cincinnati’s “senior” library and one of the oldest cultural institutions in the Midwest. If you’re interested in more Mercantile news, reviews and information check out the library’s blog – Stacked.